Belvoir presents, THE FAITH HEALER, by Brian Friel, in the Belvoir Upstairs Theatre, Belvoir St, Surry Hills, 26 October - 27 November. The lights faded to black. The play, THE FAITH HEALER, was finished. The stage lighting came back up and it was a kind of surprise, shock, wonder, when on the furniture-empty raised platform, surrounded by a panorama of painted tumultuous clouds, only three actors stood there to take the curtain call. Colin Friels, Alison Whyte and Pip Miller. They looked so few on that, what appeared to be now, very spare space. For in the previous two hours I had been taken away into a crowded world of people and places, vivd, vital and spellbinding - however squalid and sad. It was, on reflection, my imaginative forces that had been conjured, coaxed into 'action' by these three actors to have a 'world' swirling in front of me, to have what the Chorus in HENRY V asks for: "a Muse of Fire, that would ascend the brightest heaven of invention". We had three Muses of Fire, in front of us, inventing heavenly. These three actors had displayed their remarkable talent as storytellers - the very definition of what an actor is: a Story Teller (as distinguished from the other kind of 'actor', the demonstrator of emotional states, which we more often than not, are plagued with, witnesses of). How wonderful, it was, to sit in a theatre again and have a text - play - not tampered, adapted, re-written or re-located, from an experienced, even, great writer, Brian Friel. A Design from four great Australian artists: Brian Thomson (Set), Tess Schofield (Costume), Verity Hampson (Lighting), Paul Charlier (Composer and Sound Designer), led by one of the greatly gifted Australian artists, Judy Davis, as their Director. It is, relatively, rare to have such a team of excellence across all areas of the creative forces together on a Sydney stage (a notion that I understood Jonathan Church had remarked upon on responding to the Sydney Theatre scene - in case you have forgotten, he, who withdrew, suddenly, from the Artistic Directorship of the Sydney Theatre Company, before he really began, not so long ago.) And, I reckon, the Companies of Sydney should take note of the years of experience involved with this production and why its 'chance' of succeeding was enhanced with the gathering together of this calibre of artist. Certainly, we, the audience, felt safe, from the first 'beat' of the performance and became entranced, enmeshed, in an experience that had no sense of time passing - it flashed past, in the security of its all-round expertness. THE FAITH HEALER is comprised of four monologues, two by Frank, the Faith Healer, an itinerant performer (conman?) of acts of healing around the fringes of the United Kingdom - acts that are either 'momentous' or 'absurd' - and one by each of the other characters, Grace, his wife/mistress, and Teddy, his manager. Each of these characters give a testimony of shared events calling into question, subtly, what we have just heard before. The recall of the events of the play are different in their details. The play is a memory play, but of three memories of the same events, memories that are highly 'personalised', so that the end result of the 'adventure' of THE FAITH HEALER, teaches us that our own memories and stories, perhaps, are revealed, terribly, to be versions of truth that are different from our siblings, friends, for us to be able to continue forward. A reflection that sits with all of us for every part of our lives. A truth that spotlights our human frailty and connection. A striking positive truth. It's all in the language, he said to me. The play, I asked? The theatre? The whole thing, he said. This transcendent truth was evident in the experience of this production. On leaving the theatre the world I am living in had been put into a perspective that permitted it to be accepted with a curious, even if small, optimism. The tragedy of these three people as told by Mr Friel and performed by these actors was a 'message' of the possibility to believe in the common frail thread of 'being' that allows one to 'continue on', even if it is, at best, wearily. The catharsis of tragedy can be elevating. Weird but true. In our present era of political turmoil, the production, the play, became an 'olive branch' that encouraged the virtue of faith. 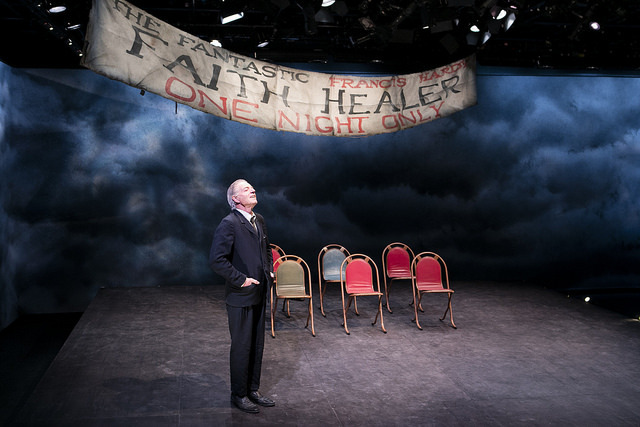 This experience of Friel's THE FAITH HEALER, indeed, in itself, a faith healer. If you didn't get to see this production you have missed something that demonstrated why the theatre is a relevant form in 2016 and the justification for its sustainability in the future. When dedicated artists, like these, all, share a vision, we all can find a way to go on, to continue to be just human with all our strengths and weaknesses. Effort will be valued. Does count. "At the end of any night's experience in the theatre, all that any writer can hope for is that maybe one dozen people have been moved ever so much or ever so slightly, and that the course of their lives may be enriched or altered by a very fine degree. 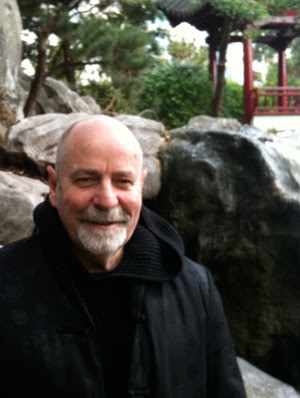 I don't believe for one second that a dramatist is going to change the face of the earth." - Brian Friel. Gate Theatre Dublin's production of THE FAITH HEALER was seen as part of the Sydney Festival in 2009. Its affect was viable then, too.